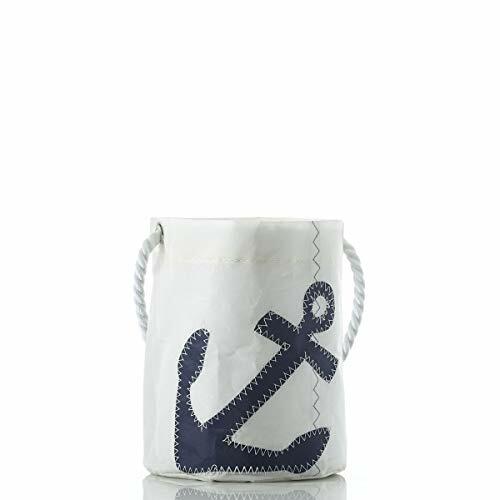 Made from recycled sail cloth and in the shape of the perfect bucket, the Sea Bags Navy Anchor Bucket Bag is a must have for everyone. Uses are endless - here are a few of our favorites: full with a collection of local products, hand-towels in the bath, whoopie pies, toy trucks.. the options are endless. Hand-spliced white rope handle knotted through grommets designed for shoulder carry. Spot clean only. Available Colors: Navy. Available Sizes: One Size Only. Handmade in Portland, Maine, USA. Dimensions: 9.5"h x 7"w.